Here is what I recieved after the May Long Challenge 2017. As you can see, both the submissions were same. I had e-mailed them at that time, but I didn’t get any reply. Some days ago, when I checked my account, I saw my ratings were dropped by 645 points. After that, I again messaged them in facebook, but no reply came. Please see to it that I get my ratings revived. As you can see, both the submissions were same. 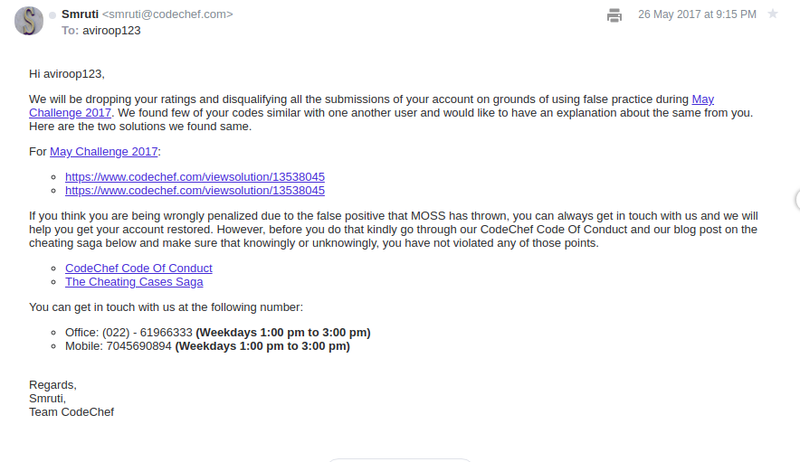 Which is exactly why MOSS detected you. I missed the point here. What explanation did you give them? Update: Your solution matched with other solutions. The automated mail sent wrong links. The final mail is sent to you. Case closed. Oh, didnt look at that! Can you forward that mail to me @aviroop123 ? @vijju123 Yes, I have forwarded the mail to you. I will automatically update when I get any news.